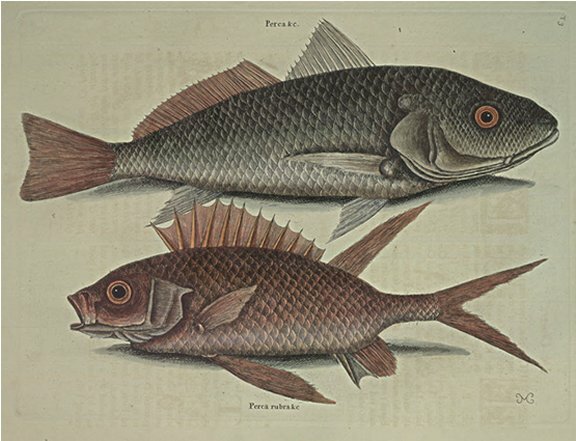 This Figure represents the common Size of the Fish, as they are found in most of the Rivers in Virginia, but in deeper Waters, as in the great Bay of Chesapeak they are taken sometimes three Feet in Length. It is covered with Scales of a reddish Umber Colour. The Iris of the Eye of a gold Colour; The Mouth wide, with Rows of very small sharp Teeth. It had six Finns, one on the middle of the Back of a triangular Form; one extending from that to the Tail of a red Colour, two behind the Gills, and two under the Belly. The Tail was red and notched. This Fish is tolerable good Meat.